i have so many christmas gifts to make, i've decided to keep them real simple :) these 8 coasters are for my colleagues at work (proper work that is :) ). 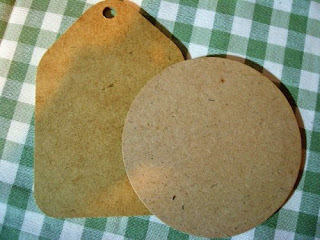 they are really simple to make, anyone can make them :) and i must thank julia at the spotted sparrow for giving me this simple, brilliant and pretty coaster idea. you must go check out her site... there are so many pretty handmade stuff there but her coasters are my favorite. she even has a tutorial on how to make them. i made all these in one night (see how simple it is?). i then let them sit for a day to thoroughly dry out before putting varnish on them. tip : if you use ink jet printer to print your decoupage images, make sure you fix them with an ink jet fixative before doing decoupage with them. otherwise, the ink will smear. 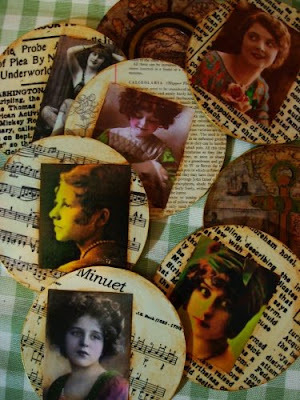 images for the coasters are taken from vintage resources, a site where people share their collection of vintage images. thank you! There's always something wonderful to be found her each day, I love your postings! Yes, I believe I found the sinister one, too cool! thank you carolyn :) you spoil me with all those praises :)))))) but thank you from the bottom of my heart... you are such an encouragement for me :) as for my colleagues... i wonder how long these will last in their hands! Hi Luthien, I love these coasters! Nicely done. The sinister lady will be fun for your male colleague. I also loved your sun and moon paintings in a previous post. Just beautiful! I just wanted to thank you for your sweet comments and prayers. You are a dear friend and I am so thankful for you. I just love you. You are so sweet and wonderful. You know, I have LCIS. Well, the meds I'm on for that caused other complications, so I needed the nova-sure ablation surgery, which removed the lining of my uterus. So, now I am having pains from that. Ugh!!! You have my work e-mail address. I will be able to retrieve them tomorrow morning. I can't wait to see what you wrote. Beautiful coasters. Thank you for visiting my blog and for leaving a nice comment. Thanks so much for your sweet comments! and these coasters are so so cute, thanks so much for sharing, what a fabulous idea for a gift! !